Above, Hellebore printed in blue on red linen. Above, the Bee & Thistle design is now available on Two Rivers hand-made paper. The print is sold mounted ready for framing. Below, the Decorated Tree in four colours on taupe linen. Kate Westcott hand-prints contemporary and striking images onto handmade paper and linen in her studio near Bath. Her designs are screen-printed with environmentally friendly inks, creating a unique range of linen for the table and prints to hang. 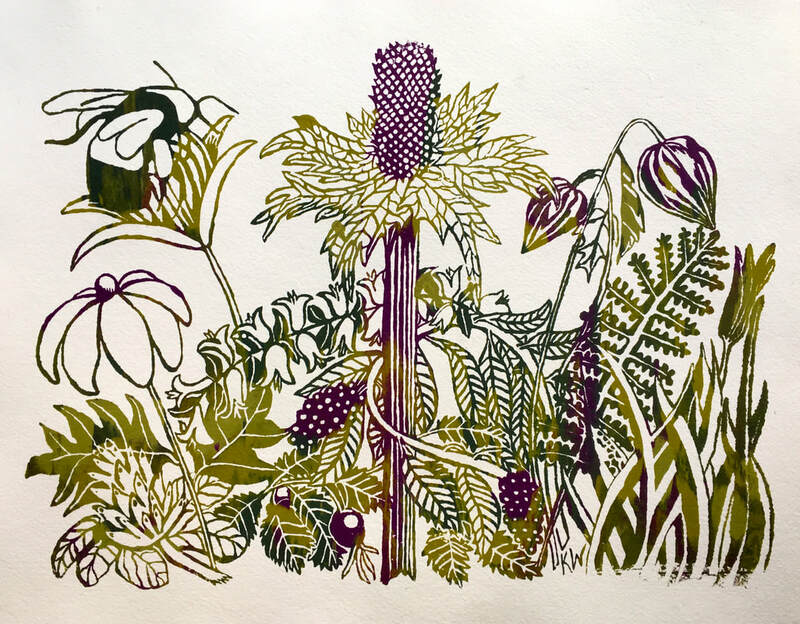 The designs originate from her own drawings and incorporate a mix of delicate, fine lined images with more bolder shapes and silhouettes from our English countryside and gardens. Sometimes a print run will only produce 2 or 3 of a particular design, on a range of coloured linen. With larger items such as tablecloths, it may be that only one item is printed in a particular design/colour. If you see something that strikes you and you would like it in a different colour, do get in contact to see if it is possible. All printed textiles in the For Sale section are washable and 100% cotton or linen. Magpies & Damsons is available now as a mounted or framed print. The handmade paper used, is from Two Rivers, an ancient water mill deep in the Somerset countryside. Above are a range of rustic linen aprons with Blackbird, Bee & Thistle and Cambridge Milk Parsley designs. Each apron has a front pocket and generous ties. The linen colour is taupe and the images are printed in green, sea green, white and deep pink. Rose Hatcher, a skilled and delightful felter, opens her Workhouse Chapel to the public, selling stunning and unique artwork of over 60 artists - I am proud to be one of these artists! Cam Valley artists will be exhibiting new work at Conygre Hall, Timsbury, Nr Bath along with demonstrations and arty activities - free entry! A delightful and diverse collection of work by 10 Somerset artists. Pottery, printed textiles, paintings, glass & etchings.